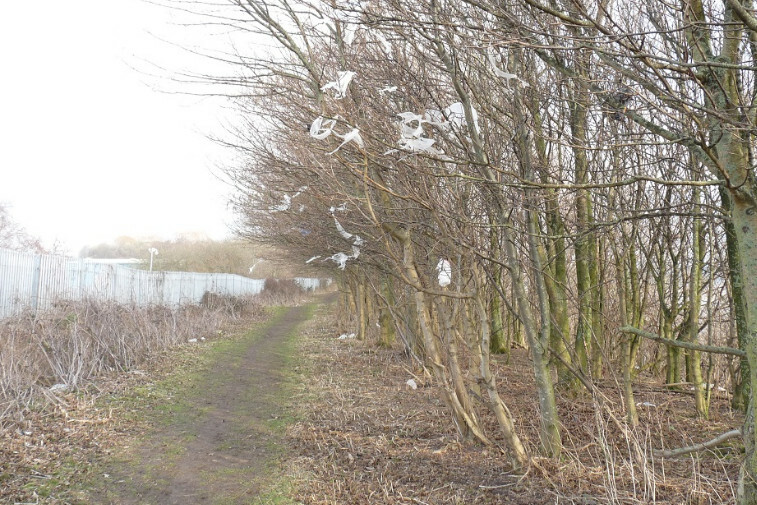 Plastic rubbish litters the trees at Pickerings Pasture. Photo L. Broad. 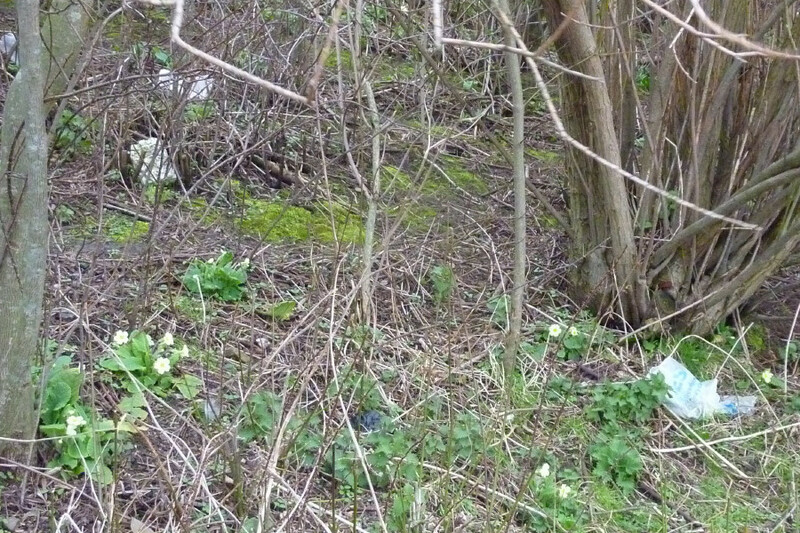 It was also on the paths and in the bramble. Photo L Broad. 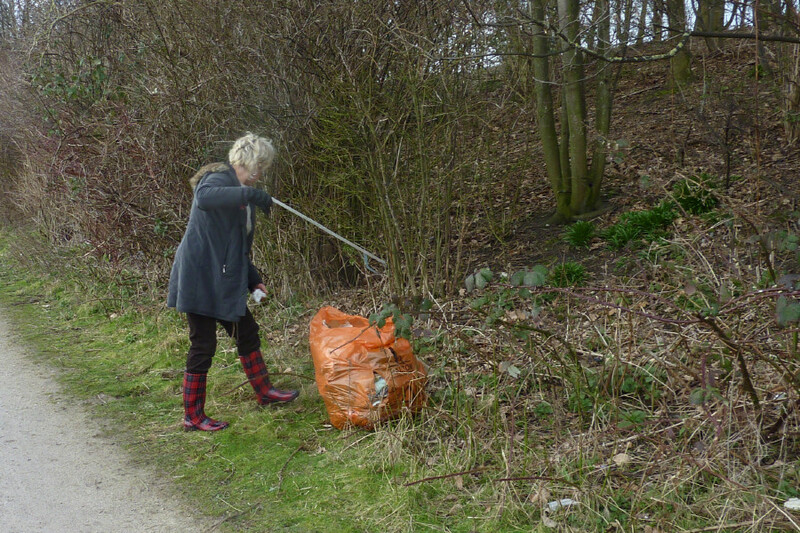 It's not often that The Friends of Pickerings Pasture undertake a major "clean up" although small amounts of litter are often removed on work-days. Also it is unusual for us all to be involved in the same task: normally there are several tasks available to suit people's ability and preferences. 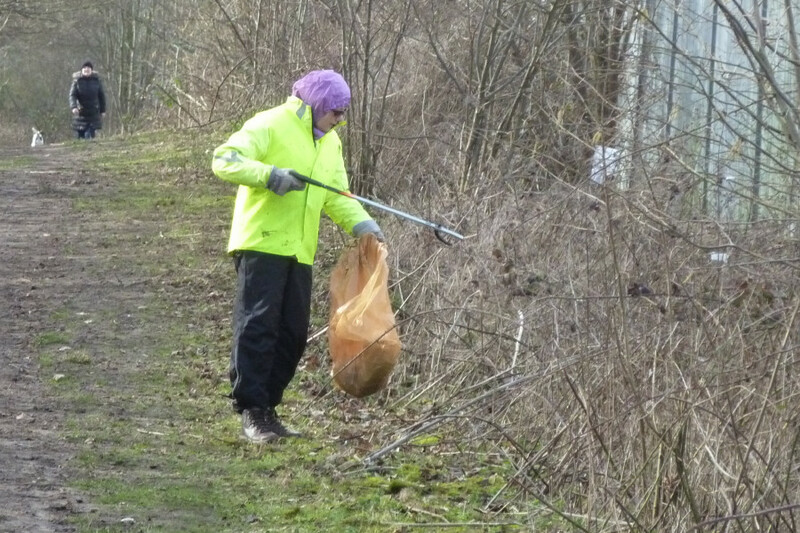 At the beginning of March '15 we undertook a major clean-up along the paths to the white bridge: especially the track along the back, butting on to the factories. 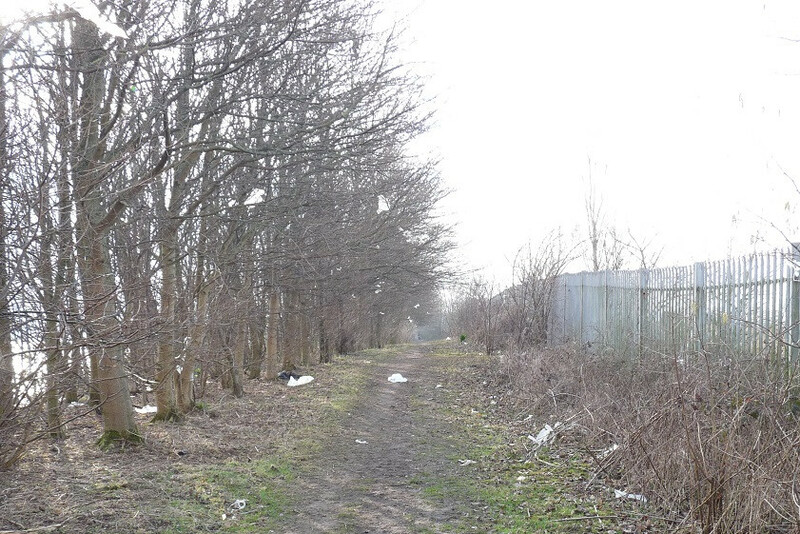 Sadly a local recycling plant has allowed polythene bags and other rubbish to blow on to our site causing a hazard to the wildlife, as well as looking so unsightly. 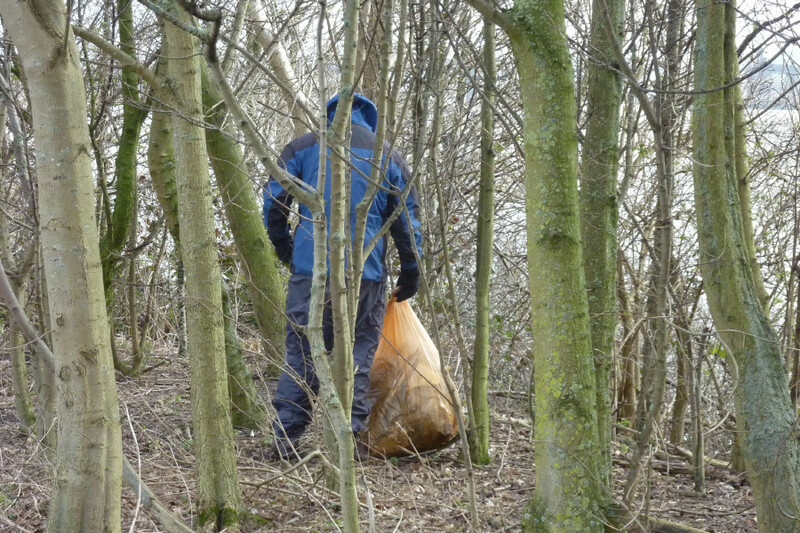 It was so bad that some bags were actually blowing into the river and others were strewn high in the trees. It needed immediate attention to remove it. 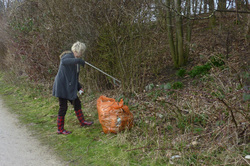 Over twenty large bags of rubbish were collected and the council removed them all the same day. 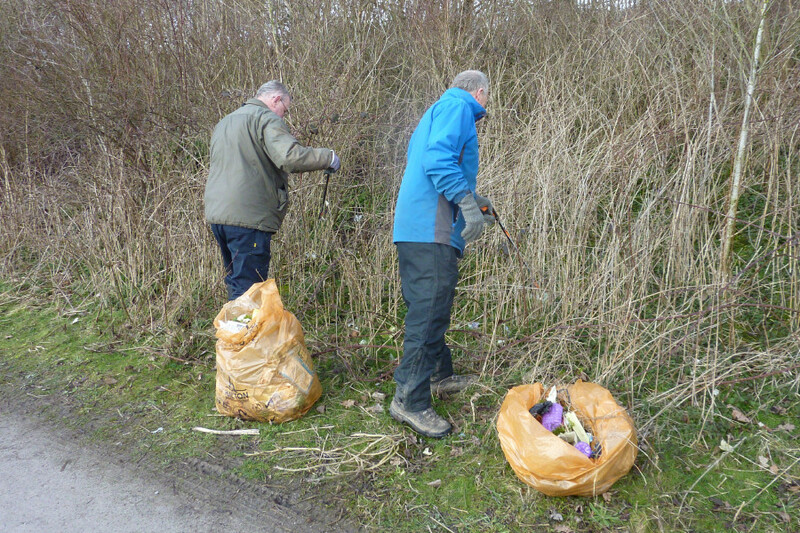 Members of The Friends of Pickerings Pasture picking up the litter from the local recycling plant. 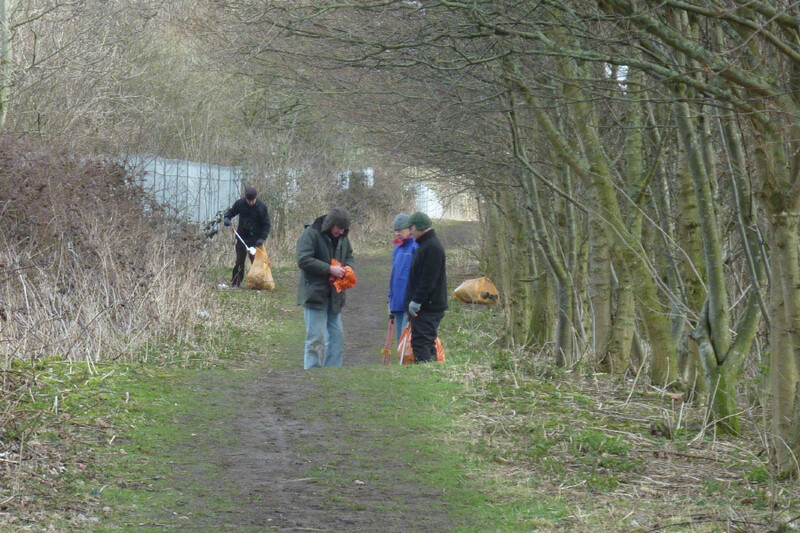 The following day a group from TCV (The Conservation Volunteers) continued the project. 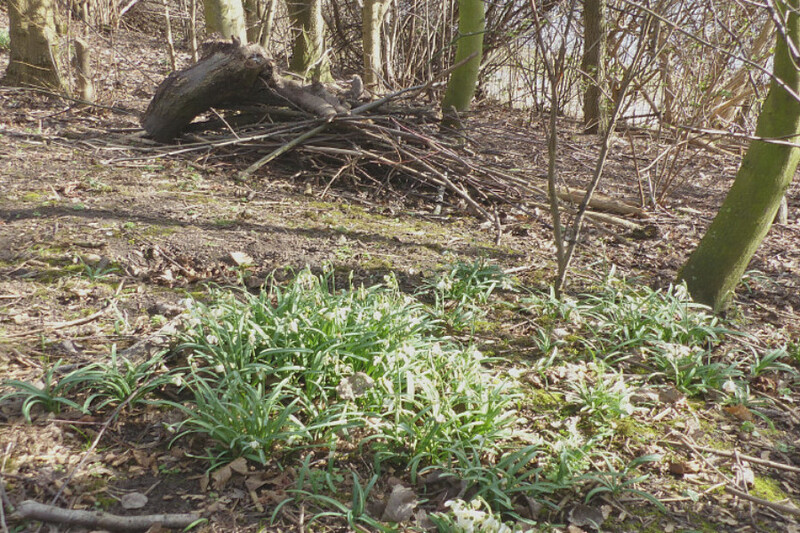 They cleared more debris, trimmed back some overhanging trees and created many habitat piles within the woodland area and along the fence line. 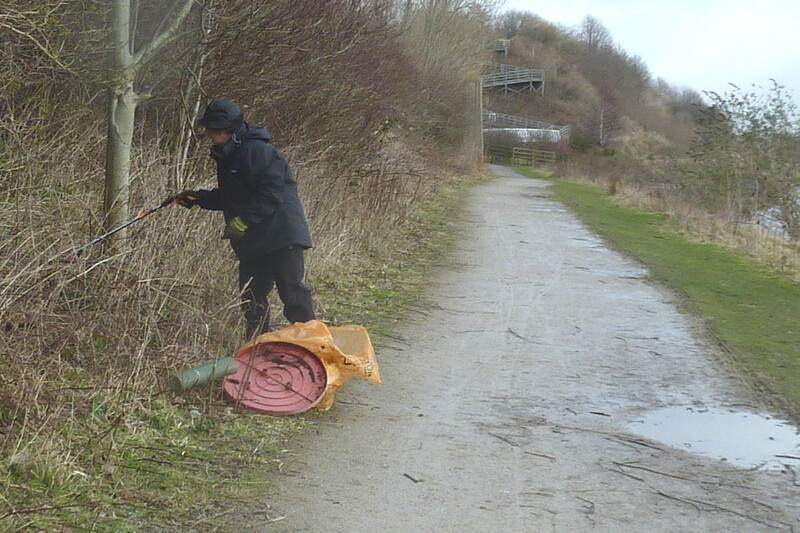 Halton Borough Council have promised some shrubs which will be planted along the fence in the near future. These will help to screen us from the factories. 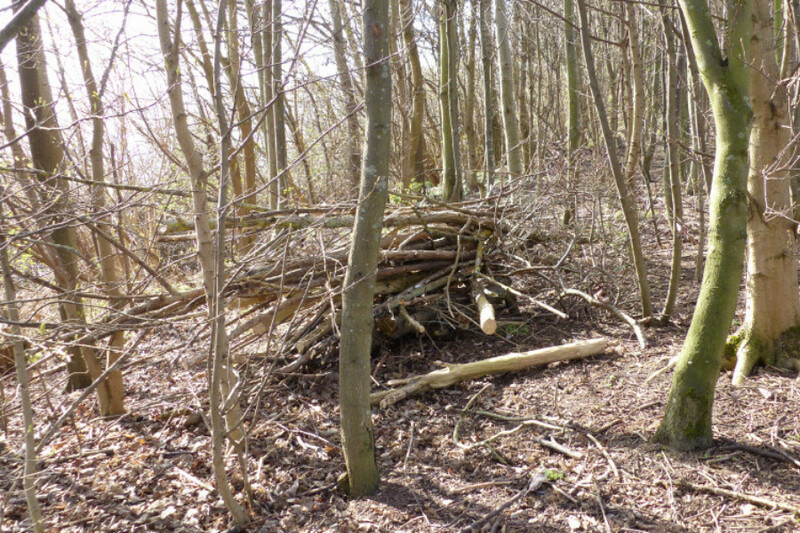 Habitat piles vary but here they are piles of old, rotting wood, twigs and leaf litter that provide a refuge for small mammals and invertebrates. The damp and decaying wood is very attractive to many insects who use holes, peeling bark and the spaces between to shelter and to lay their eggs. Many species of beetles, spiders, woodlice and insect larvae will benefit at Pickerings Pasture. 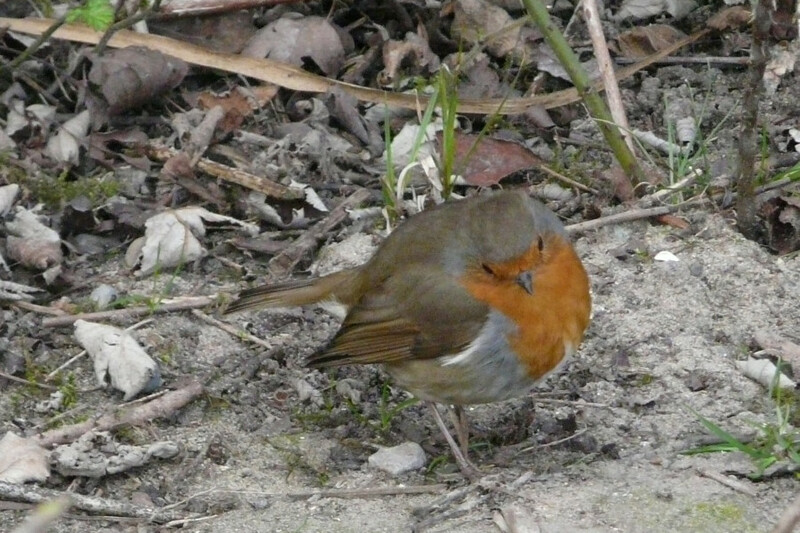 These sites will be used, especially during the winter, as scavenging sites for small birds, including our favourite, the robin. 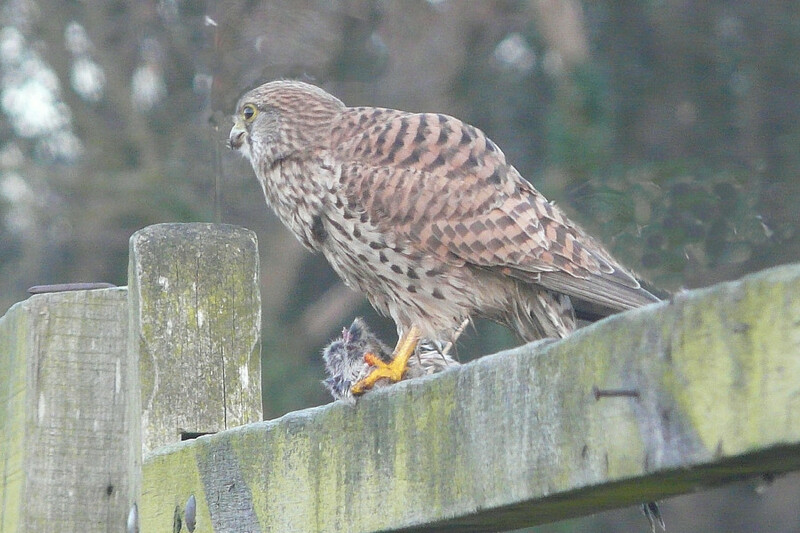 The small mammals will encourage birds of prey such as the kestrel. 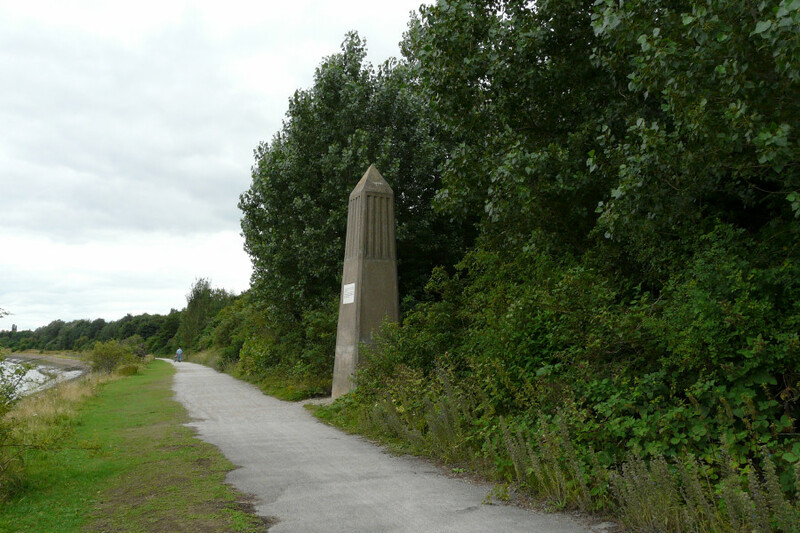 From The Obelisk - showing part of the area cleared. 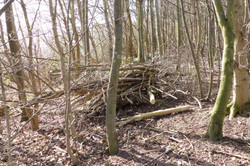 One of the habitat piles. 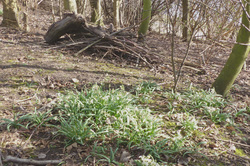 Snowdrops and another habitat pile. 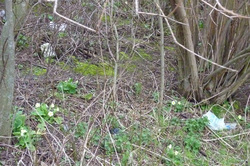 Area of primroses - spoiled by the litter. Recently there has been a lot of information in the press about pollution in our seas and oceans, particularly from plastics. The fish and birds in the river are particularly at risk but it could also affect dolphins, seals etc. as the River Mersey flows out into the Irish Sea. For more information on these issues see: ProjectAWARE (marine debris) and other similar sites. It really is a major problem: not just locally but world-wide. If you are aware of any waste products being allowed to damage the environment do please contact the Environment Agency or your Local Council.